Home › News › eBay Queen! 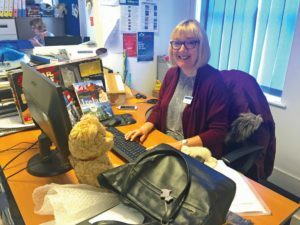 When Karen started volunteering in the Fundraising Team at Helen Rollason Cancer Charity she hoped she could make a difference as a way of saying “thank you”. Little did she know that she would make such an impact within just a few weeks of starting, after she was asked to research and sell donated items on the charity’s eBay page. “My husband has advanced kidney cancer and is a regular visitor to the Helen Rollason Research Centre attached to Broomfield Hospital. I was struggling with the whole situation and HRCC staff suggested I went for counselling run by the charity and this has been enormously beneficial. My husband and I wanted to give something back after all the help and support we have both been given. My husband took part in one of HRCC’s fundraising events, Ride for Helen, with his son and daughter and I decided to volunteer to give me another focus. I was given the task of putting items up on the eBay site which have been identified by staff in the organisation’s charity shops as being worth more than they might be able to sell them for. My role means I research the articles online to look at what they could be worth and then price them accordingly before putting them up for sale. In the past few months that I have been carrying out the role it has been very successful – it’s quite surprising what some things are worth! One item that really shocked me was some donated perfume, which included a fragrance by Dolce & Gabbana. It turned out to be a discontinued range and quite sought-after – it sold for £100! Meeters and Greeters – new Southend Hub!